About Driven to Rage & 3 Chapters | Carol Sheldon writes books exploring times-past through mystery, love, betrayal and murder. IN THE LUCRATIVE COPPER MINES OF MICHIGAN’S UPPER PENINSULA, CONFLICT COMES TO A HEAD. 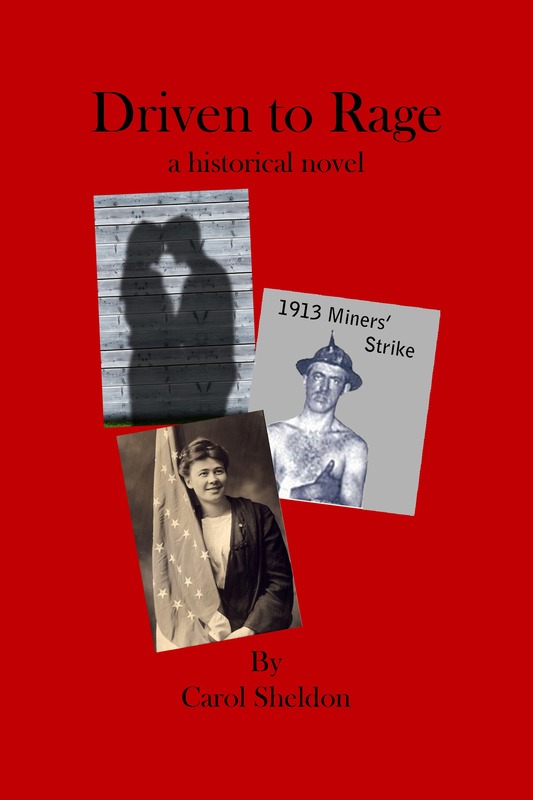 It’s 1913; the miners and laborers are desperate. Though few speak the same language, they unite to face the power of Management with determination. To the managers, their lives are expendable. In this intimate tale of a family divided, we see the drama in a human, personal light. We see conscience set against convention and brother against brother. We meet the real woman they called Big Annie, who would not be shamed or silenced while the workers suffered and died. We meet two strong women from different worlds who become sisters, united by a cause, and the courageous women who follow them. There are heroes and scoundrels, murder, lovers and secrets. Like any novel worth its weight, let’s hope this is a tale to capture your interest. “Award-winning author Carol Sheldon’s historical novel Driven to Rage explodes with tension. You’ll recognize characters in this copper mining town, including Sheriff Earl Foster from the riveting Mother Lode. How we suffer, struggling with lust, loyalty and tolerance. Driven to Rage is powerfully moving; Sheldon is a master storyteller of relationships. Reminiscent of Gone With the Wind and Grapes of Wrath.” – Teresa LeYung-Ryan, Author Love Made of Heart and Build Your Writing Life in 22 Days.